Through the years, people collect coins in a variety of ways. The collector is supported by the many different books, plastic holders and other supplies that help the numismatist from the novice to the experienced. Here’s an interesting advertisement from The Reading Eagle in February 1972. It shows “Year Sets” and their associated prices. 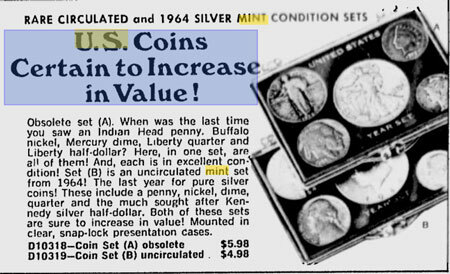 For the second set, the ad claims those coins are “uncirculated,” but since they are not in the government issued package, they are not an official uncirculated mint set. Playing the semantics game, people use “uncirculated” for a coin that was taken out of circulation early in its life and placed into a protective holder. 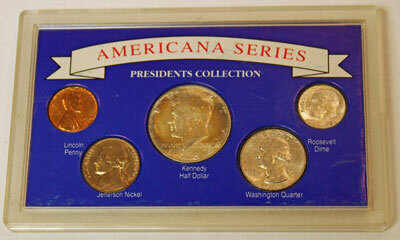 But, that aside, both sets contain three silver coins – the dime, quarter and half dollar. Those prices in today’s world would be a bargain. Interestingly, one of these, called the Presidents Collection, contains the same coins – 1964 – as the set in the advertisement above. The coins look nice, but they are neither proof nor uncirculated. Instead, they were probably pulled from circulation, or perhaps they were purchased in 2x2s from a dealer or other collector. Or, maybe they purchased the coins already compiled in the set like the sets in the ad. 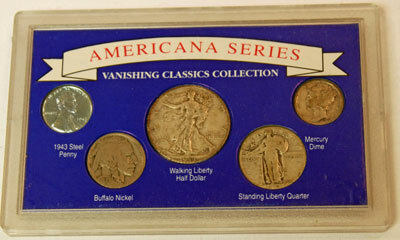 Going backward in time, the second of the Americana Series, called the Vanishing Classics Collection, includes examples of coins from several different years. These coins definitely show their age in the wear on the coins. Some of their years are difficult to discern. The Walking Liberty half dollar shows 1944 for the date. The Standing Liberty quarter may be 1928 – not positive, though. As for the Mercury dime, that one will remain a mystery. The Buffalo nickel’s partial date shows 1936. As for the steel penny, the set shows the date of 1943. But, just look at that penny. It’s looks too bright and shiny not to have been touched up somewhere along the way. 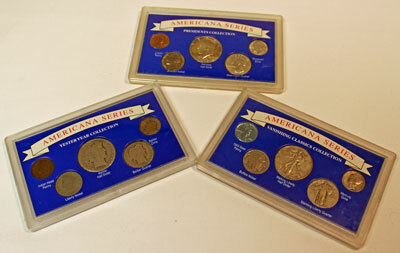 Coin tripping back in time even further, the third Americana Series, called the Yesteryear Collection, includes coins whose designs have been almost worn smooth. 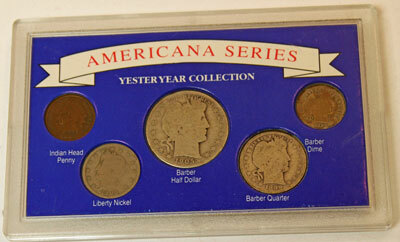 The set includes the Barber half dollar (1905), the Barber quarter (1899), the Barber dime (1899), the Liberty nickel (1906) and the Indian Head cent (not sure). These sets impart valuable insight into our circulating coinage for the most of the 20th century and some of the latter 19th century. It would be nice if the coins were in better condition, but even so, in each set three of the coins are silver. The sets provide interest and value as coins, but with silver prices increasing, their silver content in the dime, quarter and half dollar may provide even more value than the coins. It’s sad, too, to think of all the old coins that are reverting back to their metal content instead of retaining their numismatic designs and value.